Neronin knew now that he had been going about the process in the wrong way. He had let the pain shepherd him into his usual aggressive reaction. The result was more pain than he thought he could endure, and a near fatal brush with the magics of these two powerfully arcane individuals. Neronin gasped as his knees struck the ground and he heard Vuda’s words. Not for the first time was Neronin struck with apprehension over the sheer gap in power between himself and Vuda. Now he had to try to understand the force of a power he knew nothing about, all after already going through the ordeal of the necrotic magic. He was hollow and weak, but not dead yet. The Etzori mage threw out his hands and tried to push himself up off the ground. He was slammed back into the wall before he could. The force was diminished though, with Neronin altering his abrogative ether. The mage frantically thought of how he could fight the assault without fighting it. The problem was he was close to panic because of the exhaustion. Death was a very real prospect here. The initiate decided on the spot, with a moment of clarity, to push his ether at Vuda’s own. Neronin tried to divert the direction of the force toward the floor or the ceiling. The force of the attacks brought Neronin to his knees again, it did not diminish the power of the attack. The initiate was thrown once again and the initiator stood tall over him, his ether not yet dwindling. Neronin shifted his abrogation ether to push directly against the force of Vuda’s own magic. He tried to negate the force by pushing his own against it. There was a decidedly vile crackling of power in the air and Neronin’s vision was clear, but he could barely see the man in front of him. The age in Vuda distorted him in different ways than normal age wears down a man. He had clearly spent arcs with his magic, and right now that was what Neronin saw. A man with power sewn into his soul. A man who wielded the forces Neronin sought with ease. A man who could snap Neronin in two if he wanted. But Neronin was not dead, he was not damned just yet. Vuda wanted to use him. That meant the mage could survive this, and come out the other side stronger by one magic. He would deal with breaking free of Vuda’s control after he dealt with surviving this ordeal. The master necromancer was thrown against the wall again and he found that his ether force dwindled the impact yet again, as if two winds blew against him from front and back, and he remained still to them. But it was not a complete thing, not yet. Neronin’s body thudded against the stones and he poured more will into the magic to negate the attack. He pumped his resolve into it and focused his mind. Overstepping was for the weak of mind, and he could withstand this a few moments longer. He calmed himself and let the abrogative spark pull from him at a slightly faster rate. When next the necromancer was thrown against the ground his knees bucked but he threw out a hand and caught himself before falling. Neronin grimaced as he pulled himself back up to his feet. The next force against him did not slam him into the wall, but made him stagger back a few steps. The minuscule victories raised his spirits. The necromancer fought back with his dwindling reserves. "No...now, you were on to something there for a moment." Vuda scolded. "It is difficult to describe what I mean by 'neutralizing' the energy." the words were punctuated in Neronin's ears by the inner thump of another impact. "You were finally able to grasp it against the necromancer's attack because you knew the feel of that energy. But as long as you were casting the opposite spell against the incoming one, you gained nothing." His voice held the genuine passion of a teacher seeking to get past some student's mental block. An effort at patience colored his voice, "It was only when you stopped 'opposing', stopped 'fighting', that you found the right approach. It is not about overpowering a spell with another of an opposite purpose. It is about learning the grain and tone, the texture, the twist and thickness of the energy itself, the form the enemy is shaping into, that you can inject its opposite "feel" into the source and negate the opponent's own grasp of it. You can never learn the feel of an incoming spell, if you do not ever let it touch you." The gripping and throwing halted for a moment. "I felt it become difficult for a moment to shape the energy the way I wanted. I fought through it because, for one, I am far stronger in this domain. But also to urge the strength from you to maintain the block. If I let off because you have begun to get the right idea, you will not be sure, and you might go back to what you were doing before." The master reached out again and grabbed the student, lifting him by his ankles instead of tossing him into the wall. "Let's try this, I will simply hold you this way. You find the stream, follow it back and reverse it; not by force, but by...nature." Vuda began to smile as he could feel the current of energy being slowly, weakly disrupted. "Yes.....yes....follow it back....you can thicken what is thin, spread what is tight, straighten what curls. Squeeze it and pull the edges where it spreads. You don't fight the spell at its release, you disrupt its formation." He knew that actually, there was much about Abrogation that was very much negating a spell after it was cast. But that would come later. At its inception, the draw of ether was raw beyond complete control, as the caster spent the first mille-trills shaping its precise form, he gained more perfect control. A spell was never more vulnerable to disruption than when the ether was just starting to be grasped by the caster. Vuda was pleased to feel the effect of Neronin's efforts getting closer to his own clutch point. He looked toward the door where the necromancer assistant waited. Vuda used just a adjustment of flow balance to turn his student's field of vision away from the door. The woman walked back in, her previous declaration of defeat having been a ruse. Vuda's eagerness to see his test complete reached full boil. He nodded to the woman and suddenly Neronin would feel the debilitating effect of Sap. The test was whether he would realize that the second attack had resumed, or if he'd have been too fully convinced that that part of the test was over, and chalk it up to fatigue. He'd already found the feel of the Sap and negated it. Even with the disorientation of being hung by his heels, that feel would not change, and he should be able to quickly sunder its current again, while still tracking the Sovereign energy back to its source. It might have actually surprised the student to know that the master was pulling for him. Neronin was forced to spin in midair, dangling from his ankle. Neronin was beginning to understand that there was a profound difference in this abrogation magic from his other two schools of the arcane. With the necrotic spark, his emotions of fear and hatred often fueled the magic, a force to strengthen his will to fight. With the rupture spark the chaos of emotion spurred him forth as well. With abrogation one needed not to fight, not to pay heed to emotions, but to remain calm and understand enough to turn the magic on itself. The problem was Neronin had understood the Sap before he had ever been captured and strong armed into the initiation. This other magic he did not know. 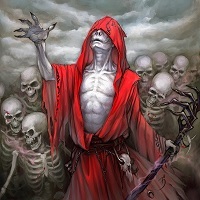 The necromancer listened carefully to Vuda’s words and was surprised the man seemed to actually be hopeful of his success. For the first time Neronin found himself wondering what exactly it had cost the older mage to initiate him, and what exactly had made him decide to. Clearly it was not done lightly, and there was no assurance of success. Magic coursed invisibly through the air and held Neronin up, blood rushing to his head. He gasped and felt a cold chill once again gasp at his physical form. It took him only a moment to realize that this was a renewed attack by Vuda’s necromantress. Apparently it had not been enough that he had thrown the attack once. The home grown mage struggled to focus on both magics, never having a lesson in the arcane quite like this. Ether twisted inside him and he found the Sap easier to negate a second time, the process more familiar now. He let his second spell corrupt the magic in the same way, equal and opposite. Neronin found the active negation actually made it easier for his mind to adhere to the theme of negation over opposition. He remained calm as he dangled and focused on the ether in the attack. Vuda was controlling him through that ether, and any weakness would lie in it. Neronin forced himself to focus on it in as much detail as his tired mind could muster. Vuda’s words were accompanied by the draining effect of the Sap. Neronin felt as though it was hopeless. He had failed to understand and he would be killed here, hanging in this cell, with the strongest mage in Etzos coaching him on how to survive. It was pathetic and he felt his mind weaken. His struggling lapsed and Neronin found the foreign power of Vuda filled his mind momentarily. Find the stream. He thought, his mental focus shifting to the ether that held him up. Ether surged from his own newly born abrogation spark and twisted around the stream of ether connecting his ankle to Vuda’s will. He was so strong, so vastly powerful. There was no hope Neronin could defeat him. But perhaps Neronin could hold on long enough to diminish the attack. Neronin once again renewed his counter Sap, threading the opposing spell through the Necromantress’ ether even as he pried at the ether from Vuda. The thematic similarities made it easier for his mind to do both. Diminishing her attack actually helped him focus on negating Vuda’s magic rather than fighting it. Neronin’s pale grey skin was turning a nasty shade with the blood pooling in his head and a vein was showing large and crooked on his forehead. The young man from the streets of Etzos felt something give in Vuda’s magic as his own ether eventually weakened the hold Vuda had. He had tried to weaken the strength of the spell by weaving his own opposing ether into it. Neronin felt himself drop a fraction and his head strike the ground. He surged his power into the Sap and felt himself throw it off completely, a flood of heat rushing back into his body. Neronin gasped in relief and his mind flooded with a joy he hadn’t felt before. Was this the pleasure of the abrogation spark, or his own relief? After the second attack was negated Neronin found it easier to focus on the first. The sparks within him, all three, squirmed with discomfort. They were vying for place and power with the addition of the third. With Neronin so close to overstepping, his soul and body were a chaotic mass of pain and arcane power. It was enough to destroy a man, but Neronin had stopped being a man a long time ago, and this vice was most familiar to him. He pushed past the pain and the wild arcane storm inside his own soul, urging his newfound abrogation spark further. The next surge of ether wove tendrils deep into Vuda’s spell, inhibiting the flow of the ether and turning it back on itself. Neronin’s back slammed into the ground and he gasped as his limbs hit cold cobbles. 'Yes!' the mage thought with an odd sense of pride, 'He's fought off the second Sap, and remained focused on negating my attack.' Vuda was fully capable of feeling an almost parental satisfaction in seeing a student succeed. Of course, the agendas and necessities of uncompromising tactics and control would always reassert themselves; not infrequently upon the new students themselves. He knew that would be the case here. The more power this Neronin displayed, the more he would ask of him as an infiltrator ofAl'Angyryl. He already had the decoy arranged. The boy, Finn O'Connor, had been nicely manipulated by his underling, Tagley, earlier this season. Regardless of the boy's conviction and genuine talent, he did not expect him to survive that gang's leader's well-documented suspicion and interrogation techniques. So when Finn went down, Noth would have confirmation that a legitimate infiltrator from the Tower had been revealed and..."dealt with". It would make it far less likely that he'd turn those same suspicions on Neronin. His new student was coming along nicely now. Vuda was finding himself to have to seriously concentrate to get his Sovereign currents past their initial generation point. The initiate was facing him now; on his knees, yes, but not allowing himself to be directly seized and moved. Both men knew that it would be as easy as turning up the power for Vuda to, once again, heave the younger man about like a stuffed doll. But that was not the point of the exercise. He could actually feel the same "grain" of the young man's burgeoning Abrogative understanding cutting him off. But there was one more detail to tend to. Vuda now did what was a classic adversarial tactic in just about any form of contention. Like an attempt to cap a flow of water from a spring, one always had to deal with the flow spurting out in jets from under the cap. This followed the ploy of matching your opponent's momentum and inertia, in order to reach a spot or a pose that would give you an edge. Vuda let his Sovereign-tasked ether slip deliberately upon itself, per Neronin's efforts, allowing a small slip of it to find a roundabout route to grab the boy and roll him over from a different direction. He did this several times and could feel the frustration building in his student. The point was made but now the purpose of it needed to be explained. "No! change nothing that you're doing. Expand the concept! It is not uncommon for a mage to need a slight adjustment of the path that fuels their spell. One of the first features of learning Abrogation is to cover an entire area with the counter twist to what domain you believe you will be facing." Even as he finished saying it, he could feel these additional avenues of approach being closed off. "Yes! That's right. Feel the grain now, NOT of what I am imposing, but of what YOU have inverted to counter it. Make the very stone of the room pulse with that sense of conversion. Leave me no path that does not twist my ether in upon itself." Again, it was an unspoken understanding that even the most meager of adversaries would probably be capable of defeating this covering force. But it was the technique itself that was being learned here. The necessary practice would eventually bring about swiftness and power to it. And the area it could cover would expand as well. Vuda breathed heavily with exertion, giving no thought to how exhausted the initiate must be. That was unavoidable. He dropped his attack, satisfied with what the necromancer had displayed. But it was not over quite yet. "Okay. I am dropping my attack, but do not stop! I want you to truly block off this whole room with your Abrogative effect. This is tactic you will find useful when you know an adversary approaches, but has not yet arrived. For that reason, I am not assaulting you as you complete this task. Soon you will learn to be able to power a different domain past your blocking field, Necromancy perhaps. And then your enemy will be at your mercy." The magic was flowing through his senses and Vuda’s words were a haze. The room swam before him like peripheral images around a focal point. The focus was the arcane energies that flowed invisibly through the air. Neronin could feel the contending powers choking on the bit of his own ignorance. If only the will to understand was enough for success, Neronin could feel it like starvation. He needed this power. His mind latched onto Vuda’s words, the desperate coaching drifting to him through the haze of his own overtaxed mind. The Etzori mage gasped and swayed from his kneeling position. Neronin repeated the words in a soft rasp, barely loud enough for anyone but himself to hear. “Feel the grain…” He said, following his own magic. Neronin began to funnel more ether through the Abrogative spark and along that tendril. With each pulsing expulsion of ether he directed the magic to another portion of the room. The negating magic warped and latched on to elements of the room. The stones of the floor, the bricks of the walls, the chains and shackles. Neronin felt Vuda’s power drop away, though his mind barely registered the respite. He was so far gone into the magic. He continued to slowly piece together a defense against the attack that did not come. Grey and panting, Neronin slumped forward. One long fingered hand reached out and steadied himself against the cold stone floor. The mage stared down at the stone and continued to pulse out his body’s ether. Neronin heard the words fall from Vuda’s lips and felt a defiance ignite within him. Soon he wouldlearn to power a different domain past the blocking field? Did Vuda think Neronin a novice of the arcane? Neronin began to summon the ether within him to throw the necrotic attack outward but found that while he maintained his abrogative magic he could not gift the necrotic spark with the ether. It roiled within him with anger and Neronin felt the ether slip from his control to recede back into his soul. His power was waning and he was at the end of his rope. Neronin slowly remembered where he was and what Vuda had said, like a man waking from a dream and recalling the last few moments of it. As clarity returned to his mind along with the pulsing pain of the near overstepping, Neronin gasped and let the magic fall away. He was staring down at a corpses’ hand, chalk white and grey. It took him a long moment to realize the hand was his own. It revolted him as he stared down at it and his magical sparks lay dormant. For a long moment he was simply a tired man fearful of the deals he had made with dark powers. Neronin sucked in a long breath as the moment passed and looked up at Vuda. “My enemy will be at my mercy?” Neronin asked bitterly, slumping back against the wall, chest heaving slowly. Despite his need for recovery, the necrotic grip on his body made even breathing seem unnatural in him. “And What will my mercy do for your enemies, Chief Adviser? What is your goal here?” Neronin coughed and his eyes drifted over to the spit in the wall. He crawled over to it and pumped some cold, clear water into his mouth. He gasped with thirst as half spilled down his front. He took a few more gulps and turned back to watch Vuda. With the water through his wilting system Neronin felt a rush of thoughts of Noth, Ryder, Navyri, and the rest of Al’Angyryl. Would Neronin be the weak link that betrayed them to the very powers he had told himself he would fight? He was tempted to rationalize his own capture as out of his control. Vuda was a stronger mage with the power of the Etzori government behind him. Surely if he had such comprehensive knowledge of the faction’s membership and movements there was nothing Neronin could do to contend. But that was a weak excuse. Neronin was the most formidable mage the faction had, though he paled when compared to Vuda. Nevertheless, he should have been more careful. He had taken to being bold in his attacks, claiming crimes in the name of Al’Angyryl to build their credit amongst criminals. He had sown fear in the masses, ignoring the attention of those that mattered. Who cared if the commoners feared them? They would come to fear Al’Angyryl in time no matter what. Neronin saw now that he had mistaken his own opinions on the dangers and potential of common men as reality. He had ignored the real threats for too long, and they had caught up to him. Now he wore the bridle of slavery and had been forced to take Vuda’s concessions or die. Even as he stared up into Vuda’s eyes, waiting for an answer to his question, Neronin searched for a way to out maneuver the old sorcerer. For now, he would bide his time. The old mage kept the sneer from showing outside of his eyes. "I can not help but wonder if your attempt to seize upon your first spark was going to take the form of aggression against me." The gleam waned as he shrugged, "No matter. You would not be the first. But you should know that it is only the potential wasting of my spark that stayed my hand in the first place." He turned to his assistant with no more than a nod. She give a quick, but nonetheless subservient, bow and removed herself. There was only the sound of her footsteps, followed by the clacking and light thud of a door being closed behind her as she left. Vuda's eyes had been directed at Neronin, but had not been entirely focused. Once the woman was gone, they drilled into their target. "My goal? My goal is no different than that of most powerful men throughout history. To claim all that I can, and to hold onto it; to destroy those that would seek to take it from me. It is NOT to impose tyranny, though I suppose the wildly varied definitions of that word would have some call me a liar for that. They do not realize the uncompromising nature of the decisions that powerful men must make every trial. I do not bother with trying to earn their support. So long as they stay out of my way, they have nothing to fear from me. Is your own goal much different, Neronin? Or those of your rebel faction, Al'Angyryl?" He waved his hand, and with some focus, Neronin might have noted a new deadness to the ambiance of the room; the lack of the reverberation of their voices. "Another noteworthy benefit of this spark. The hardening of the air not only serves as a barrier to incoming attacks, it also somehow seems to deaden sound. We can speak now without fear of being overheard." He took a seat on the bench provided as a bed for the cell. In his experience, it did not help negotiations to "loom" over a man you were trying to ally with. "Okay, let's not kid ourselves. I like power, and need it to get things done. Your leader, Noth, the 'Prince of Eternal Mercies' is no different. The only reality that separates us is that I have it, and he wants it." The skepticism on the initiate's face was plain to see, and Vuda smirked just a bit before continuing, "Don't worry boy, I am not going to bother trying to recruit you with some speech about my superior political and sociological morality. I'll readily admit I'm no better than them, but I DID have things running smoothly. It's those that try to bring upheaval that are causing the damage. Frankly, they should take the blame for what they force me to do in response." A sigh accompanied a suddenly sheepish look on the aged face. "Forgive me, I guess I slipped into a speech after all." The sheepish look vanished into cold calculation, "Anyway, regardless of my own convictions, I don't expect you to care about them. You'd be in no position to act upon them anyway. For that matter, if you were to drop on your knees and swear your allegiance right here and now, I wouldn't believe it for a trill." He sat closer now, his body not intruding upon Neronin's comfort zone. But the leering gaze as he leaned in countered this all too effectively, the result clearly intended, "No, I believe something a bit more tangible than feigned loyalty is in order here. I'm quite certain that you will go blabbing to Noth what's happened here, and you'll put your heads together to find a way to twist it against me." He reached into his pocket and pulled out a ring, one that Kovic could have warned him of, as well as Tirta, were she still alive. He bounced it lightly on his palm as he leaned back now, in control. "I believe something removed from the politics of the trial is in order. Something beyond current allegiances. Something personal. Something worthy of a new partnership. What do you say, Neronin. How would you like to have..." here he directed his gaze to the ring in his hand, prompting his new initiate to do the same. "...control over your...old friend, Gavrel?" Life had again handed out the subtle flavor of irony. Long had his power been the tool with which Neronin staved off the trappings of obligation. Obligation to his people, obligation to his friends, obligation to his very soul. But that power had never been one of the purity seen in the old tales, never a good force. It had insidious machinations upon his every moment, and this the lynchpin. He was shackled to Vuda’s will, foresworn from the freedom he sought, by the very power with which he had attempted to wield to freedom. His power was now Vuda’s tool. As Vuda’s words became more frank, his aspirations of an existence outside the hierarchy slipped further and further. Within the three sparks swirled about each other, their energies left each a uniquely vile sensation. It was vile, but it was the succor of life for the Etzori mage. Long and hard had his addiction become to the arcane. Even then, the third spark seemed a trifle trophy against the loss of his own willpower. But what was one man to do against such power? Vuda had already trapped him before Neronin had known of it. The Chief Advisor dined on intrigue and supped on betrayal. What could a hedge witch do against such as he? “Gavrel? What do you know of my oldest enemy?” Neronin’s eyes gleamed through the sweat and the blood. The necrotic spark within curled a tendril of black rage through his intestines. Neronin could feel the undead thing within gnash its maw. It scared even he, for it was not fully known to him and never mentioned in any text of necromancy he had even seen. “Gavrel will suffer by my hand, Vuda, and no other.” The audacity of that bold statement was not lost on the necromancer. He claimed vengeance over an enemy far away, even as another defeated him. Neronin’s head cleared a bit as anger pushed the haze of exhaustion back and made room for the sharp analytical mind than was usually there. Neronin blinked at Vuda. “Control…” He said, the word rolling experimentally off the tongue. “You can provide means of this.” Neronin said. It was not a question, but a verbal thought. Neronin’s mind had returned to his oldest hate. The ring seemed innocent enough as the necromancer’s eyes bore into it. He was not learned in such enchantments and, luckily, was aware of his own shortcoming. Neronin did not touch the ring. The trap had been a complete and unavoidable one. Vuda was indeed the most powerful man in Etzos. His keen tactics foresaw every move Neronin had made, and knew him before Neronin knew he was something worth knowing to Vuda. He was bound to him now, no matter what the end of this meeting. Vuda would decide his fate. All Neronin had left was to beg for terms. The necromancer straightened and turned to the Chief Advisor. “If I am to be a servant to you, I ask for you to use me to my fullest.” Neronin said softly. “Allow me the extent of all my craft and the study of the mysteries I have always pursued. Provide me with the tool to create my servants and to wield my sparks and I will be more valuable to you… And Gavrel, I want to hand that man in my fist.” The mage coughed rubbed the spittle and dried blood from his chin with the back of his hand. Neronin looked to Vuda for his response. He hoped if he was to be a slave tethered to the great mage he would at least be allowed the powers he had accumulated so far. The question posed, “Gavrel? What do you know of my oldest enemy?”, brought only a slight lift of an eyebrow. His eyes dropped briefly to the ring for emphasis, "What ever I need to know, boy. If Gavrel has information I need, or the capability to perform a service for me, this gives me the means to...convince him...to..." he paused a moment to find the most cruelly demonstrative term, "...volunteer it." He gripped the ring firmly now, holding it out toward his new initiate, "This is not a mind-control ring, young man. Or anything so insidious as that. It has only a single function. And right now, with this one removed from my finger, he is free to remove the subordinate ring from his own finger, and be free of its effect. Fortunately, I have his arms fixed firmly to the wall of his own cell to prevent this from happening." A mockery of sympathy crossed Vuda's face as he continued, "Oooh, how the poor man must suffer the frustration of feeling this opportunity and being unable to act upon it." An additional coat of spite touched his eyes, "And how much deeper this frustration will strike when he feels YOU take my place." He paused to let Neronin register his last comment, "Yes. That is correct. He will feel your presence through the connection, as you will feel his." A barely stifled chuckle escaped his lips at the young man's reluctance to take the bauble from his hand. "Okay, I can not blame you for being distrustful. What man of common sense does not possess that trait in this world? Very well, let me demonstrate." He walked toward a torch on the wall, "As I said, this ring has only a single function. It transfers sensations from he who wears this ring, to he who wears the one on Gavrel's finger." he slipped the ring back onto his own finger, his eyes clouded slightly as his conversation moved to a target beyond the cell's boundary. His lips moved slightly, speaking inwardly to a distant listener. All at once he thrust his hand into the flame of the torch, a few moments later, by which someone may be able to attempt to judge distance, a man's voice screamed in horrified agony. Even though he had rarely heard this voice raised in pain, Neronin would never fail to recognize its ugly familiarity. The fact of its wailing in pain was the only thing making it pleasant to hear. Vuda did not leave his hand there for long, as he pulled it away, Neronin would begin to see trails of smoke following the movement of the scorched flesh. "Remember, and understand, young man, that I said it only transfers sensations." He grimaced in pain of his own as he removed the ring and felt the burn now himself. Plunging his hand into a bowl of cold water, he sighed deeply, "Ahh yes, that's better. Now, in addition to the pain he's just suffered, he has the mental torment of knowing I may put it back on at any time." Vuda pulled his hand out of the water to reveal a patch of angry red blisters. He shrugged, "It will heal easily enough....ow..." and put it back in the water. He leaned out the door and made a gesture. His assistant returned pushing a cart with a man strapped to it. The man blanched with uncertainty and fear. Vuda smiled with unmasked viciousness. "Here now is a more efficient way of using it." He put the ring on the immobilized prisoner's finger, and then abruptly snapped the finger back against its knuckle. There was a muffled snap and Gavrel's howling voice echoed up once again from the depths of the underground prison. A second, a third, and finally the entire arm at the elbow were horribly snapped before the young man's eyes. Not from any sympathy for Gavrel of course, there was still a series of winces on the expression of the initiate as Vuda completed his horrific demonstration. The snapping of the arm caused the young man to look away. He looked back in time to see the Chief Advisor cruelly twisting the broken limb, scraping the broken ends of the bone against each other. Gavrel's screams reached new heights and then abruptly stopped. Vuda frowned a moment and then shrugged, "Hmmm....must have passed out." He looked at the strapped man. "Well, no need to make you suffer as well." he nodded to his partner, and she pulled a gleaming dagger from her robe and brought it swiftly and neatly through his throat. The man looked strangely curious, and it would occur to Neronin that the victim was still feeling no sensations and probably had not seen the blade or what was done with it. A few moments after the prisoner sighed his last breath, Vuda removed the ring. He held it out to Neronin a last time. "As for the rest of your questions, rest assured I would never seek to stifle a mage's ability. By all means, use the fullness of your power. Develop it and experiment with it. I do not require that you must ever betray this Noth. Only that if I DO come to require it, you will do so. Apologize before his dying eyes, if you feel compelled. Lay the blame at my feet by all means. I do not care if you like me or hate me. Only that you obey me." Obey. The bane of all he strove for. Obeisance was a poison to his soul, though it be damned and corrupted in a thousand varied ways, that was what brought him pain. A life lived in the shadow of authorities. A horror of macabre skills and attitudes brought on by the heavy-handed treatment of betters and the avoidance of such traps. 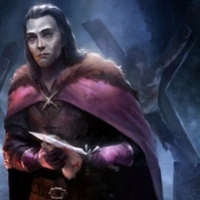 His father first, then Gavrel, and then the masses of hateful encounters that his necromancy was fraught with, and finally Vuda. The crown jewel of tyrants. Vuda. The word made his face twist with loathing. The concessions Vuda made to heartfelt sorrow or blame simply added insult to injury. What did Neronin care about reason or blame? Action was all there was in this world, and if he did not control his own then he controlled nothing. Vuda asked for obedience. Vuda asked for everything. The master mage had been at the game longer than Neronin had been alive. Far longer. The trap that held him, while made to appeal to his loyalties, had been laid so completely that Neronin could do nothing to avoid it. He would accept because he hated Gavrel. He would accept because he did not want to die needlessly in the bowels of Vuda’s tower. He would accept because while he had been searching for the fiendish ex-master for seasons, Vuda had known about him and had caught him. He would accept because they was no other choice. “Fine.” He managed to choke out. The necromancer reached out a shaking hand towards the ring and pulled it from Vuda’s grasp. Gavrel’s fall to Vuda had shaken him. The necromancer was indeed imprisoned here, perhaps in an identical cell. That oldest of his living enemies who carried with him then weight of a thousand wretched memories. How they did not balance against the light weight of the ring in his hand. He did not put the ring on his finger right away, but held it clutched tight in a fist. His grey fingered hand going even paler with the tightness of his grip. He turned flinty eyes on Vuda. He seemed to steel himself for a moment. Many questions came to mind. How did you find Gavrel? What do you want from all of this? How did you come by the power to bind people with trinkets such as this ring? He found himself cutting them all off. “I will.” He said tightly. He looked at Vuda then and his mind shifted back out of the emotional state it had been thrust into at the sound of Gavrel’s voice. He found the numbing lack easier and easier to achieve the more he dwelt with such a strong necrotic spark within him. It was as though the thing ate away at his own humanity and lifeforce and left a half-dead husk. “You have obedience, Chief Advisor Vuda.” The words were of a chilling iciness as they slid from his lips. “I keep my magic and my… mobility, and you have my skill in whatsoever you please.” His manner was stiff and his eyes did not blink as he forced himself to meet the gaze of the older mage. The pale necromancer seemed to hold no vestige of the beating he had taken for a long moment before breaking the eye contact and looking away with a shuddering sigh. “What do you have in store for me next, then? Another season pinned in this cell?” Neronin asked, the barb in his snide tone subtle. It had only the hint of disrespect in the flavor of it. “I can’t imagine myself very useful here. Will I implement my magic against your enemies? Perhaps you wish me to provide you undead troops? I assure you my abilities may be strong, but undead armadas are still beyond me.” Neronin spread his hands humbly. The expression on the Chief Adviser's face did not flinch or brighten in reaction to any of the young necromancer's remarks. He knew from his own distant past that being coerced into obedience was a severe blow to one's pride. He'd had that same futile determination to never bow to such a thing at that age, and had gone to the predictably trite extreme of vowing to die first. It had been as much an exercise in denial for him then as it would have been for Neronin now. He had to give the young man credit for accepting the unpleasant reality of his situation more quickly than he had at that age. But it has nonetheless been the reason the master mage had taken this approach; personal vengeance rather than self-preservation. A young buck such as Neronin, probably still convinced of some intangible notion of invulnerability, would still have ultimately broken, but only with absolute hatred pumping through his veins. This way, though he would harbor great resentment over being given little choice in the matter, as he grew in strength, especially in Abrogation, there would be appreciation, however much he denied it. As long as Vuda did nothing to rub the young man's face in it any further, the bitterness would fade as his power grew. He let the ring slide from his palm. The initiate was hooked. His clear desire to have Gavrel under his heel was the key to it all. And the old fool had brought it on himself, coming to Vuda for help with promises of detailed information about Noth and his mage minions. Vuda was well aware of which mages Noth had gathered thus far, and from where. All, that is, but the previously unidentified Neronin. It had not taken long at all for Vuda to wade through the details and realize the opportunity Gavrel had presented to him to get an agent into Noth's company. Gavrel had apparently been greatly concerned over a few confrontations that had shaken his confidence in his ability to squash his old assistant, and had made the mistake of laying his vulnerability out before one who had a timely need to exploit that very thing. Gavrel too, was driven by his feud and had accepted a ring from Vuda eagerly, thinking it to be a boost to his power. Vuda chuckled at the memory of the outraged look that had bloomed across the fool's face when things became clearer. What's a sucker to do when punching Vuda in the face only transferred the pain and daze back to himself? Sure, Vuda's face had grown a lovely bruise and some swelling, but Gavrel had more than paid the price for his attack. Shaking off the warm memories, Vuda now let a smile show. A patient smile, one that encouraged trust. "I'm going to say again my boy, I am not trying to hinder your growth in both power and versatility in any way. I know that it grates to know that the more you learn, the more I have at my disposal to ask of you. But you have been given reward enough that I do not feel there should be much cause to resist my requests. Freely or not, you have now joined what will be the winning side. And that is never a bad thing." He continued, counting off on his fingers, "I have given you a powerful new spark; I can provide training if you wish, here in the city; I have given you complete control over your most hated enemy...other than myself, of course;" he said with an actually genuine grin, "And...you are free to go, because you are correct. I have no purpose that will be served by you being held here. I did not part with my spark just to see it wasted." The old master maintained his patience in the face of what bordered on a defeatist attitude from the new Abrogator. "You will grow into your role, Neronin, believe me. I had doubts at first myself. Those undead troops will serve you yet. I may well ask to...borrow them from time to time, but the power to raise them will be yours alone." Hid gaze became piercing for a moment, "And alright, let's be honest; the thought of eventual payback is surely present in your mind. You wonder if I may let you grow for a while, make use of your position within the Prince's ranks, and then snuff you out before you can become a threat to me. All I can say to that is that I have sufficient support throughout this city to feel secure that you will never be a threat to me. Likewise, I have faced such initial resentment in others like you before, and they have all come around to appreciate what I gave them. Lastly, if it should turn out that I have overestimated their loyalty and underestimated their power, I will deserve their betrayal..."
He stood back, his arm outstretched in the direction of the open cell door, and nodded a bow of sorts to his new initiate as he left. Watching Neronin's back as the young man left, he finished his comment in his mind, as he patted his pocket, where the as-yet-unmentioned third ring in the set was hidden, "...as will you."